Designed and manufactured entirely in Televes Corporation. Our experienced and highly qualified telecommunication engineers have incorporated digital processing into the light-weight handheld meter. 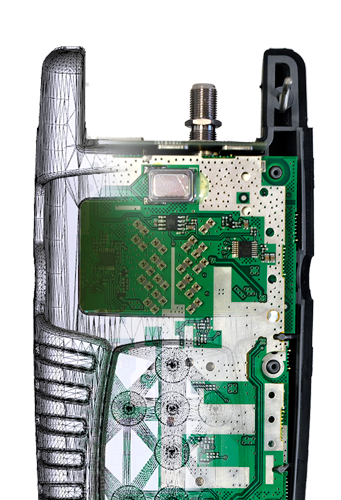 The H30FLEX is entirely designed by Gsertel, company within Televes Corporation, where our team of experienced and highly qualified telecommunication engineers managed to integrate digital processing in a handheld unit of 1lb of weight. Each H30FLEX includes more than 5,000 components and integrated circuits. Once all the materials are ready, the manufacturing process starts. This involves three well differenciated manufacturing processes, all of them performed in the facilities of Televes Corporation in Santiago de Compostela (Spain). GCE, a company in Televes Corporation, designs and manufactures all the printed circuits (PCB) that conform the different functional modules of the H30FLEX. Once checked, the PCBs are handed to the SMD technological center where three automated lines are ready to mount the most demanding components (with sizes down to 200 microns and BGA mounting technologies). The H30FLEX is then put through a especial process called SPI (Solder Paste Inspection). SPI is a process by which only the exact amount of tin is supplied to each of the routes in the PCB. This eliminates potential soldering problems that could inadvertedly pass an inspection but generate issues long term to the owner of the equipment. If this wasn’t enough, after the SMD process, each mounted PCB is validated with a combination of AOI and AXI controls. Both inspection processes (Optical and X-Ray) make sure that the soldering process is 100% correct. Any marginal deviation means that the module is discarded. All the parameters and values for each module are registered in order to allow the integral traceability of the product. Televes Corporation has their own facilities for melting, injecting and casting metal and plastics. The high density dual-injection polycarbonate and rubber housing provides the meter with the necessary protection in case of drops or accidental impacts during its use on site. These elements are supplied to our facilities in the form of small plastic balls. The materials are then put through a series of melting and injection processes until the final components are ready for a chemical protective bath. This protection assures the best long term resistance of the product. Each polycarbonate or metal element of the H30FLEX is inspected with artificial vision machines in order to make sure there are no fissures or imperfections. We recognize this process might not sound very glamorous, but we think is vital not to spare any resources or knowledge for one of the most advanced products developed by Televes in its more than 50 years of industrial experience. By the time the components, PCBs, screen, protectors and polycarbonate covers are assembled, the H30FLEX has already gone through more controls and inspections than any other similar product in the market… But this is not enough. There are three types of final functional controls that the product has to go through before it is delivered to our client. Routinary stress cycles: automatic process that measures the individual performance of each component against a table of theoretical values. Climatic chamber: Each H30FLEX is swicthed on and connected to a TV signal whilst is submitted to temperature cycles that oscillate between -15º and 70ºC and up to 98% of humidity. Final inspection of all the different functionalities, carried out by a specialized technician. All this effort only has a goal in mind. We are proud of the reliaability of our H-Series. The H30FLEX includes a 1-year warranty and 6 months for the batteries.